As soon as our group arrived, I knew we were in for an awesome tour. This is my favorite type of group: friends and team members from work who are already comfortable working together. Groups like this visibly relish the opportunity to spend some time together in a new atmosphere, getting to know each other even as they explore and learn more about our county's coastline. The relaxed and humorous tour environment arrived with the first few visitors. As we waited for the rest of the group to arrive, I was surprised to learn one of the group members had never even been to our coastal community in the months since she'd moved to the San Francisco peninsula. The best part of my job is having opportunities like this: to get to know new and interesting people while showing them something new about this place I love so much. The sun was shining but the wind had a bite to it as we set out. Undeterred by the cold, we headed west from our meeting point towards Pillar Point, the tiny peninsula jutting out to the world famous big-wave surf spot known as Mavericks. The harbor district just to the east of the legendary waves is an interesting site in and of itself. We passed Romeo's pier, a now-condemned piece of local history that will not be around for much longer; the harbor commission recently approved the pier's removal as a public safety hazard. As we crossed the stretch of sand that separates the estuary from the harbor, we followed fellow-guide-Michelle's insightful directions on how to cross the small stream without getting our socks wet. I spotted some exciting birds circling above the estuary, including a hawk. I happened to be the most enthusiastic about the bird sightings in the group, as the rest were more interested in the marine mammals poking their heads above the surface on the opposite side: a group of three harbor seals shyly glanced at us before tucking back beneath the surface and disappearing again into the harbor. The small Pillar Point peninsula hosts a US Navy installation that dominates the land feature. The base sits on top of a dramatic set of cliffs, and we hiked beneath the cliffs out towards the tip of the point. When we arrived at mavericks beach, most of us were looking out towards the enormous waves crashing violently against the mostly-submerged rocks t hat make these waves so massive - and deadly. One of us, however, was looking down: she found a dead crab and a morbid fascination with poking its sandy carcass. Some of the group gathered around to watch and quip as she pushed its lifeless claw around. For a moment it appeared almost alive. A place like this offers something for everybody. Some adventurous types went close to the water for a game of tag with the tide as it advanced and receded. Others stayed back to ask Michelle and me some tricky questions. Some quietly took in the salty air and watched violent white water clashing against this tiny peninsula. On that small strip of sand at the tip of a tiny peninsula, it feels almost like we've reached the end of the world. On our way back from Mavericks beach, I split up with co-guide Michelle to head back to Seville Tapas, our lunch spot for the day. Michelle headed upward, to show the more eager visitors another view of the legendary waves from above the cliffs. The rest came with me to gawk at the amazing spread prepared for us at Seville. Known for their cheeses, cured meats, and sangria, Seville really delivered on what they do best with some amazing sandwich es and tapas. And, of course, a pitcher (or several) of sangria topped the lunch off. We greeted the rest of the group as they arrived about twenty minutes later, everybody ready to eat. Despite the cold, our group opted to sit outside and enjoy their lunch and the beautiful view of our harbor. 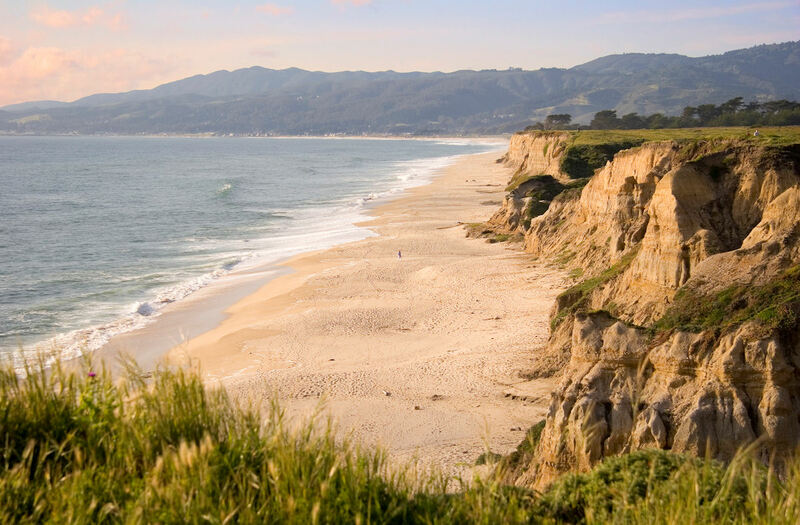 This simple tour was really designed to showcase the amazing things going on right here on the San Mateo County coastline, and we did just that. Of all the things to do here on the coast, simply coming and taking a look (and a bite!) is well worth the trip. By Old World standards, Half Moon Bay is young. But in California history, the town dates back to the Spanish land grants issued in 1841 - and before that, the native Ohlone populated the area since around 320 AD. Half Moon Bay, called "Spanishtown" by the Anglo settlers who came with the great California Gold Rush of 1849, is blessed to have so many 19th century buildings around and near historic downtown Main Street. Half Moon Bay is most famous for its two big gatherings - The Annual Art & Pumpkin Festival in October - and the Mavericks Invitational Festival which is held in the winter in conjunction with the big wave surf competition (dates vary because wave conditions vary).